Laundry—I’m sure someone out there enjoys doing it, and if it’s you, I have the number of a good psychiatrist. J Joking aside, keeping up with laundry seems an almost impossible task. It’s something that has to be done and on a regular basis. And for those who say all jobs can be done as to God, I agree. We are serving others when we do their laundry. However, menial jobs are best done quickly and efficiently to leave us time to do the weightier things in life (although wet laundry is pretty weighty). Everyone has to figure out a system that works best for himself or herself or the couple-self. In the case of a couple, perhaps they decide the wife will do the laundry and the husband will take care of cutting grass. The trick is to work out an equitable system for you. When my children were younger, I did a load of laundry every single day. I’d often throw a load in the washer in the mornings before work and dry them when I got home. *Warning--wet clothes in the washing machine will soon sour. Don't leave them too long. Don't ask how I know. * My sons, and often my husband, helped me fold the clothes and each person put their own clothes away. In the last year or so I’ve changed my routine. I decided to do the laundry in one day—on either Friday or Saturday. 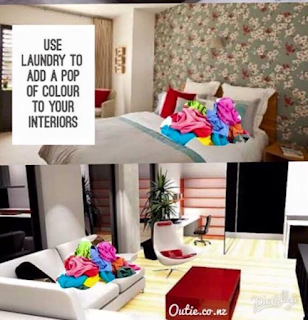 For fold up clothes—towels, pajamas, t-shirts, etc., I or my husband wash and dry several loads and dump them all on the couch. That night, we watch TV and fold the clothes. This system has its drawbacks. Dumping them all on the couch will cause wrinkles. Any clothes that I don’t want wrinkled, I’ll grab and drape over the top of the couch. This is the fastest, easiest method I’ve found. Clothes like shirts, dress pants, and skirts are washed, dried, and immediately hung up. If I don’t get them out fast enough to avoid wrinkles, my dryer has a steam cycle that does my ironing. J Works for me. Added a shelf to feed the cats on and a bar to hang up clothes straight from the dryer. The cabinets were already in place! This has increased the efficiency of doing laundry. And I'm loving the office. The words above the window says it all--God is our light even when we do the laundry! I have laundry room envy. I hope you enjoy your new office. And you are right, whatever works for each family.